Nagaoka University of Technology (NUT)’s Global Pro-Active Root Technology Program was accepted for MEXT’s Doctoral Program for World-leading Innovative & Smart Education (WISE Program). This program aims to produce professionals with profound knowledge of fundamental technology, which is the basis of industries related to the intermix of materials science and power engineering. This program will contribute to solution of SDGs and nourish the following four categories of international-level faculties; Pioneering power in academic fields, Leading-edge IT capacity, Pioneering human power and Social implementation and execution abilities. 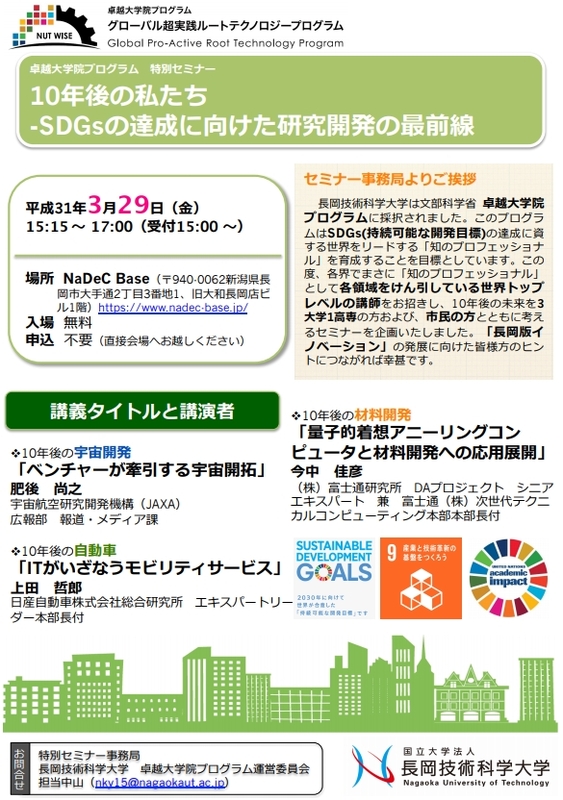 NUT invites the world's top instructors who are leading each field as "Professionals with profound knowledge" in various fields and we organize a seminar to consider the future of the next 10 years with three universities, one college of technology and citizens in Nagaoka. It would be good if everyone could provide tips for the development of "Innovation in Nagaoka". Space development in 10 years "Space exploration driven by ventures"
Automobile in 10 years "Mobility services invited to IT"
Dr. Tetsuro Ueda, Expert Leader, Nissan Research Center, Nissan Motor Co., Ltd.
Materials development in 10 years "Quantum conception annealing computer and application development to material development"
Dr. Yoshihiko Imanaka, Senior Expert, DA Project, Fujitsu Laboratories Ltd. and General Manager, Next Generation Technical Computing Division, Fujitsu Ltd. Admission free. No advance application required.